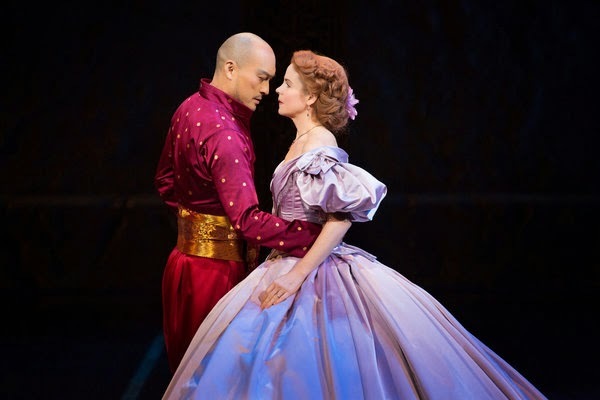 Critics At Large : Something Old, Something New: The King and I & Something Rotten! Something Old, Something New: The King and I & Something Rotten! The answer, alas, is no, but in truth I can’t envision a production of this Rodgers and Hammerstein musical (adapted from Margaret Landon’s twice-filmed novel Anna and the King of Siam) that could. The show opened on Broadway in 1951, when Rodgers and Hammerstein were already legends. It was their fifth collaboration and fourth hit; two of the others, Oklahoma! and South Pacific, were still running. It starred Gertrude Lawrence, whose agent had originally suggested the book as promising dramatic material for her; she won the Tony Award for her performance but died in the second year of the run. Yul Brynner played the King of Siam, who hires Anna as part of his agenda for bringing his country into the modern world and whose thorny relationship with her forms the dramatic arc of the musical. Brynner also starred in the faithful 1956 movie version, opposite Deborah Kerr – which is still the way most people know The King and I. It was last revived on Broadway in 1996, with Donna Murphy and Lou Diamond Phillips. Hardly a Rodgers and Hammerstein enthusiast, I skipped that one, but the combination of Bartlett Sher, Kelli O’Hara and the Japanese film actor Ken Watanabe as the King drew me this time. And it’s certainly impressive visually: lush, layered, and no one knows how to use the space of the Beaumont with Sher’s expansiveness and variety. But The King and I is still The King and I, starched and treacly, with those painfully banal Oscar Hammerstein lyrics. (He also wrote the book.) As in most of his collaborations with Rodgers, the music often soars above the lyrics, and this one has several pretty ballads (“We Kiss in the Shadows,” “I Have Dreamed, and especially “Something Wonderful”), as well as the instrumental “March of the Siamese Children,” which – like “The Carousel Waltz” from Carousel – stays in your head afterwards. Vocally, the role of Anna is a good fit for O’Hara, but then, what isn’t? She can sing anything. Dramatically, though, it doesn’t do much for her, just as it didn’t do much for Deborah Kerr. The only idea Hammerstein came up with for the part is that she is just as obstinate as the King, and since he’s written as rather cutesy, he’s an easier target for audience affection than she is. Instinctually, O’Hara brings the character more warmth than Anna often has and plays against her stubbornness – an admirable impulse, but it leaves her without a center. And “Shall I Tell You What I Think of You?”, her (private) response to the King’s intractability on the subject of the house he promised her and now claims he didn’t (she’s been residing in the palace for the months since she arrived), isn’t much of anything if it’s not an expression of fury. Watanabe gives a more interesting performance. His comic scenes wink at the audience, but he stylizes his dramatic scenes and his solo, “A Puzzlement,” in a way that gives them almost the formality and exoticism of kabuki. I can’t tell how much of the stylization derives from his difficulty with the language and how much of it is a conscious choice, but the result is very effective. Among the supporting cast, I particularly liked Ruthie Ann Miles as the King’s head wife, Lady Thiang, and her rendition of “Something Wonderful” is the musical highlight of the show. Ashley Park plays Tuptim, the unhappy Burmese slave brought as a gift for the King; she gives bravura performances of Tuptim’s three songs (joined on “We Kiss in a Shadow” and “I Have Dreamed” by Conrad Ricamora as Lun Tha, her secret lover), though perhaps it’s a mistake to sing these pieces as if they were the knock-‘em-dead soprano arias in an operetta. Presented in that way, they feel like art songs in a concert; they stop the show cold. As the Kralahome, the King’s prime minister, who doesn’t approve of Anna, Paul Nakauchi imports fine shadings of irony to his line readings, and Jake Lucas brings a likable earnestness to the part of Anna’s son Louis. But as his counterpart, the Crown Prince Chulalongkorn, Jon Viktor Corpuz seems a little remote. The talented Christopher Gatelli doesn’t get much of an opportunity for choreography until the second act (though he takes advantage of whatever chances he does get), when the English emissary Sir Edward Ramsey (Edward Baker-Duly) arrives in Bangkok and Tuptim stages her Asian adaptation of Uncle Tom’s Cabin in honor of his visit. This ballet is called “The Small House of Uncle Thomas,” and it’s the only element in The King and I that I always enjoy. In Gatelli’s hands, it’s a gem. Xiaochuan Xie is the première danseuse, and the other principal performers are Lamae Caparas, Cole Horibe, Sumie Maeda, Christopher Vo and Michiko Takemasa. All six deserve kudos. 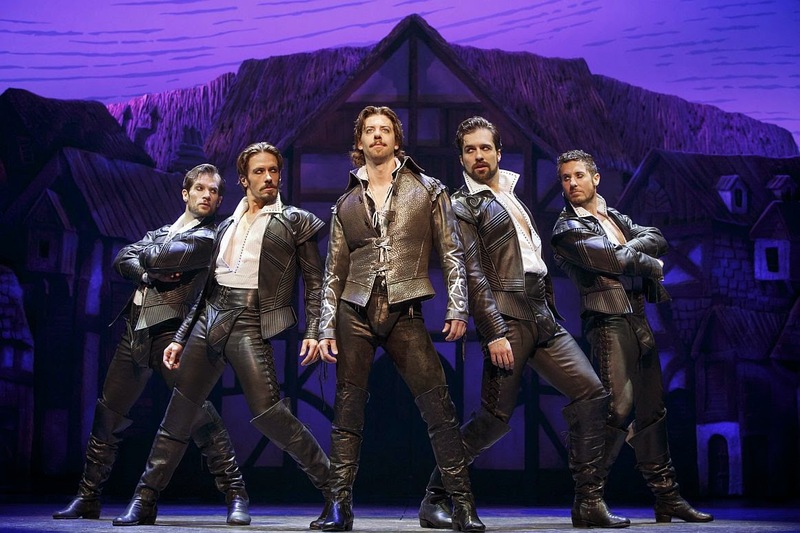 The premise of the new musical Something Rotten! is uproarious. 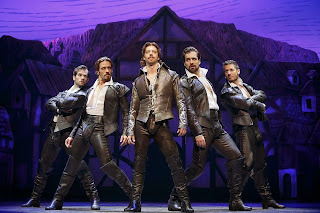 In the London of the mid-1590s, where the young William Shakespeare (Christian Borle) is all the rage, a pair of thespian brothers with a troupe of their own, Nick and Nigel Bottom (Brian d’Arcy James and John Cariani), are having a tough time filling seats. In desperation, Nick consults a seer named Nostradamus (Brad Oscar) – not the Nostradamus, but his lesser-known nephew. Nick wants Nostradamus to peer into the future so he can get the jump on some as-yet-unknown theatrical phenomenon. But Nostradamus sees the future in fragments, out of context, and sometimes he doesn’t quite get it right. At first he sells Nick on the idea of musicals. Then Nick presses him to spill the secrets of Shakespeare’s biggest triumph. By the end of act one, the Bottom brothers are hard at work on a musical spectacular called Omelette. The producers had such faith in this show that they’ve opened it on Broadway without trying it out anywhere else in the country, and if the enthusiasm of the matinee preview audience with which I saw it is any indication, their gamble might just pay off. But the writers – Karey Kirpatrick (book, music and lyrics), John O’Farrell (book) and Wayne Kirkpatrick (music and lyrics) – aren’t parodists; they’re more like amiable jokers whose stunts entertain their friends at a party because everyone in the room recognizes the references. When I was an undergraduate at Brandeis, I was lucky enough to take a seminar in theatre criticism from the great reviewer Louis Kronenberger, and one week he talked about the kind of show that becomes a hit because, as he put it, it’s like a bowling ball that rolls down the center of the lane toward the audience. Something Rotten! is one of those perfectly aimed bowling balls. In the mid-first-act number “A Musical,” the Kirpatricks allude to more than a dozen musicals and the audience howls and cheers at every allusion – but not because the lyrics burlesque them cleverly or even embroider them. The audience is really cheering itself for recognizing the references. The production was directed and choreographed with efficiency if not inventiveness by Casey Nicholaw. 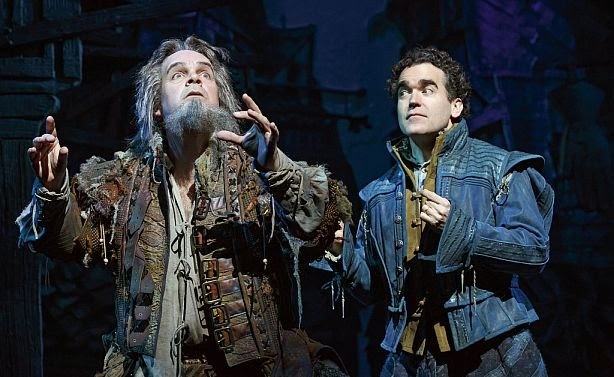 The first Nicholaw show I saw was The Drowsy Chaperone and though he’s the go-to director for big Broadway musicals (The Book of Mormon, Elf: The Musical, Aladdin), aside from Chaperone I tend to prefer him in his pared-down revivals in the Encores! series (Follies, Anyone Can Whistle, The Most Happy Fella), where he isn’t working so damn hard to deliver the boffo goods. Compared to a prizefight musical comedy like The Book of Mormon, Chaperone was modest and light on its feet. Only a few numbers in The Book of Mormon seemed to me truly inspired, and maybe you can’t pull off true satire (of the South Park: Bigger, Longer & Uncut variety) if you’re also going for a gold-plated Broadway hit musical; you have to send the audience out into the night feeling good. I realize that my reserved reaction to The Book of Mormon puts me in a small minority, and I suspect that my lack of enthusiasm about Something Rotten! will too.